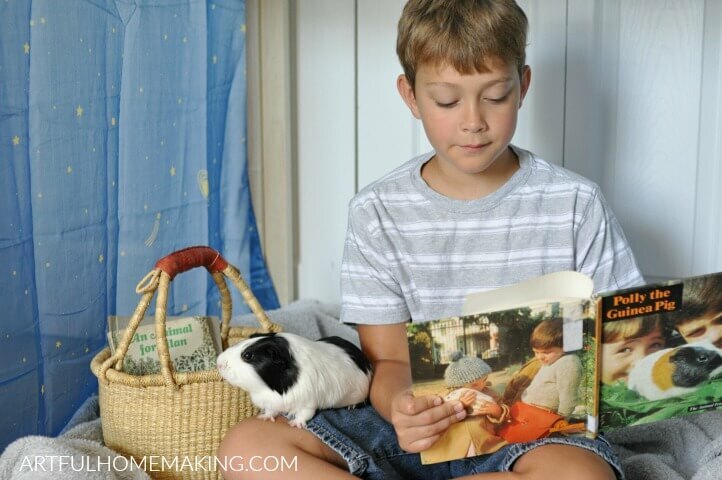 The best natural toys for kids are the ones that encourage imaginative play. It’s also best if they’re made from natural materials. Here are a few of our favorite natural toys. I’ve always preferred toys made with natural materials. Not only are they beautiful, but they just feel good to play with. Waldorf toys are some of our favorites, because they are so beautiful and they fulfill my requirements for natural toys. Natural toys are like works of art to me, and I love to see them displayed in our home. They’re the toys that will be kept and passed down from one generation to the next. When I’m shopping for natural toys, I look for toys made with wood, silk, and wool. I look for toys that encourage open-ended, imaginative play. Some of my favorite natural toys for kids include wooden blocks, a wooden dollhouse, dolls, dress-up clothes, and playsilks. Playsilks are some of the best natural toys for kids, because there are so many different ways to use them. You can use them to build a fort, make a cape, or wrap up a favorite doll or stuffed animal. With some imagination, a playsilk can become almost anything! Recently, Sarah from Sarah’s Silks sent us one of her beautiful Wooden Play Frames. When it arrived, I couldn’t wait to put it together (and it only took me a few minutes to assemble). She also sent us a Fort Kit, which contains a Giant Silk Scape and four Wooden Play Clips. The Fort Kit is just what you need to turn the Wooden Play Frame into the perfect hideaway for a child. 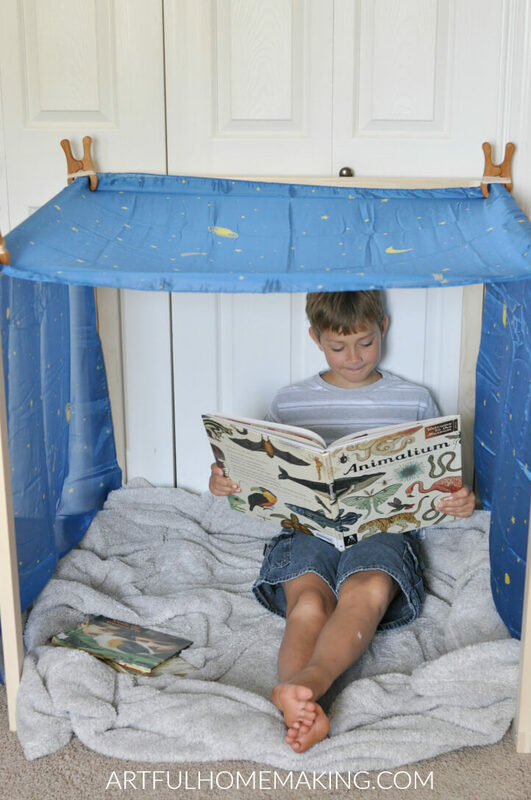 The Play Frame is a simple wooden frame that you can drape blankets or playsilks over to create a fort or a playhouse, a puppet theater, and more. There are several different ways you can drape the playsilk over the play frame. If you drape it over the top, it makes a cozy space for playing or reading. My son has already spent hours in his fort! 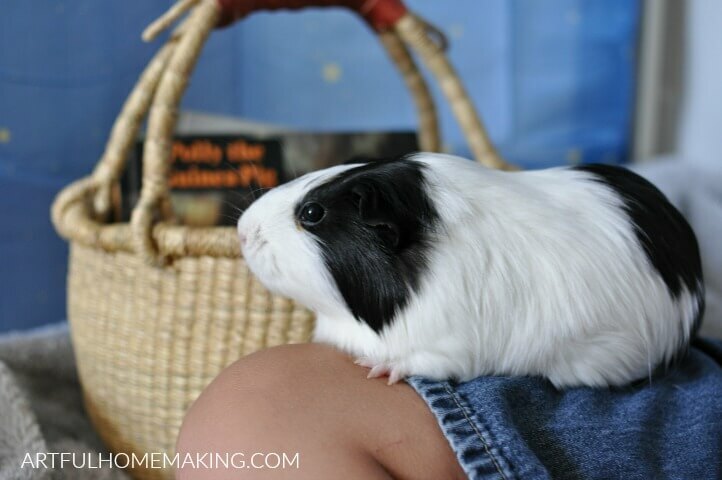 He especially loves to sit in it with our guinea pig, JoJo. They like to read books and eat snacks in their secret hideaway. JoJo likes the play fort too! If we drape blankets around all four sides, she likes to walk around and explore. 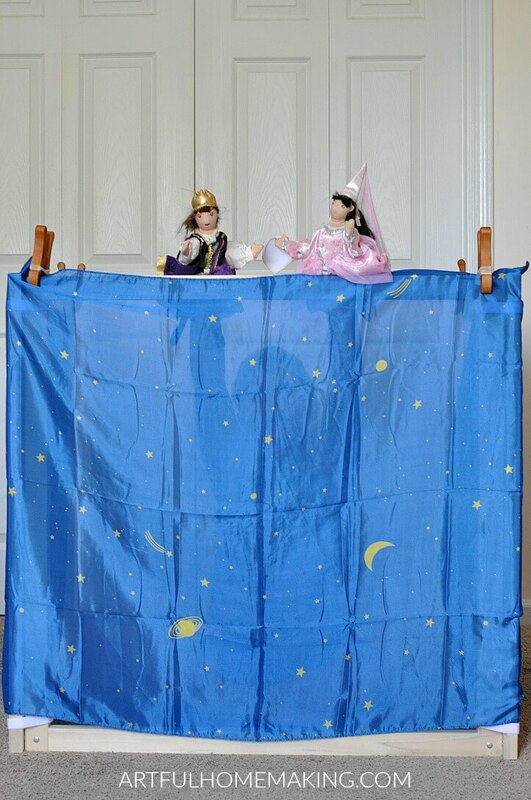 If you set the Play Frame up differently (draping a playsilk over the front of it), it makes the perfect puppet theater. The Play Frame is easy to put together and it folds up compactly when you need to store it. 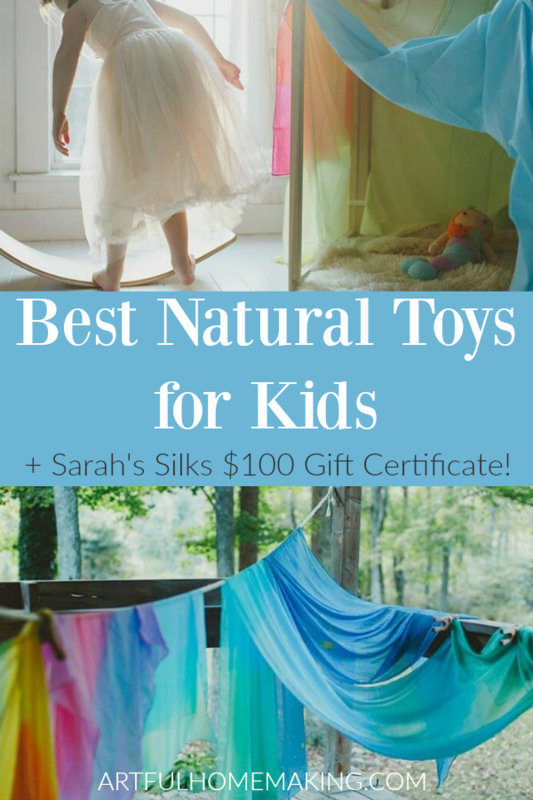 In addition to the Play Frame and playsilks, Sarah’s Silks makes many other natural toys for kids, including adorable dress-up items and the Wavee Board. The Wavee Board is an heirloom-quality toy that can be used as a car track, bridge, balance beam, stepping stool, and more! It’s even strong enough for adults up to 200 pounds. Today I’m so thrilled to be partnering with Sarah’s Silks to bring you a giveaway for a $100 Gift Certificate to Sarah’s Silks! Enter the giveaway using the Rafflecopter form below. P.S. For my international friends, this giveaway is open to you also! A winner will be chosen at random and displayed on the form after the giveaway ends. Don’t want to wait for the giveaway? Get 20% off with coupon code artfulhomemaking, or shop here and the code will be added to your cart! Playsilks, Wavee Boards, Dress-Ups, and Play Frames—this is the perfect opportunity to stock up with the 20% off coupon code artfulhomemaking! Disclosure: I received free products in exchange for a review. I only review things our family would use and love. Read my full disclosure here. Sharing here. The playsilks look awesome! My daughter would love them! Great giveaway! What an awesome giveaway! I’d love one of their large silks! I would order the wave board. Those silks look wonderful! My boys always loved wooden blocks. I think many of what I consider classic kids toys are made from natural materials and tend to stand the test of time. that wavee board looks awesome, and those silks amazing ! My kids are all grown, but one day I hope to have grandkids, t hanks for sharing these amazing toys . 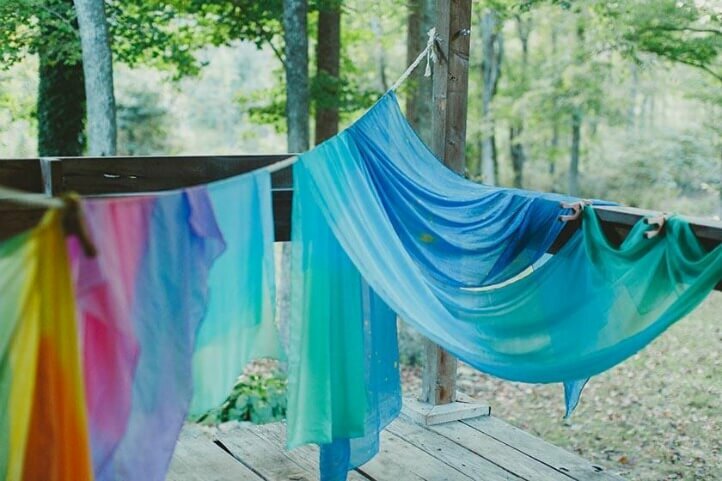 I just love the rainbow play silks and I would love to get some for my children! I love the Play Frame and the Fort Kit. What a summer my kids could have with these! The Wavee board looks like awesome fun! How fun! I did not know there were so many new silks! But I think my five year old would LOVE the Wavee board- that is exactly what I would get if I won! Thank you so much! I had never thought of silks. Thanks for the idea. Beautiful products, and so much better for imaginative play! We would love the playsilks in our house! I’d have to choose the wavee board. Both my toddler and elementary schooler would love it! A rainbow cape and crown or giant play silk! We love natural toys at our home, especially silks. THANK you for hosting this giveaway! We have playsilks in many colors and my girls adore them! I would definitely get a waver board! I love simple toys that encourage active play and imagination. I would love a wave board for our home! I would also love to add a rainbow plank silk plus all the costumes!!! I’d choose an Undersea Canopy. Wow it’s going to be so hard to choose, I think my top picks are 3-4 playsilks in different colours (one of which has to be the rainbow one) and then a Wavee board…that has been on my wish list for a while now! These are beautiful! My children would love the silks for many different things. I also love the wooden clamps!! What a great idea! I just ordered and got my girls a wavee board, a mystery seconds bag, and a dress up seconds bag. I’d love to add some mermaid dress ups next time I shop. I would get the giant play silk for my toddlers to play with their baby sister. My first enchanted playsilk was ordered a few days ago on its way! Sarah’s Silks have been on our wishlist since my daughter’s first birthday. This would be the perfect way to jump-start our collection! I just bought my first silks from Sarah’s this week! I’m opening a Waldorf inspired child center in my small town this fall… My goal is to get more silks before we are officially open. This would be great! Thank you! I would pick the wavee board! So many choices, but I’d probably choose either the fort kit or the wavee board. The wavee board, for sure! I would get dress up and wooden toys for my kiddo. Thanks for extending this giveaway to international friends! My daughter would love a fort, so thank you for introducing us to Sarah’s Silks! If I won I would order playsilks to use with our Puggles at church or that Wavee board looks neat!!! 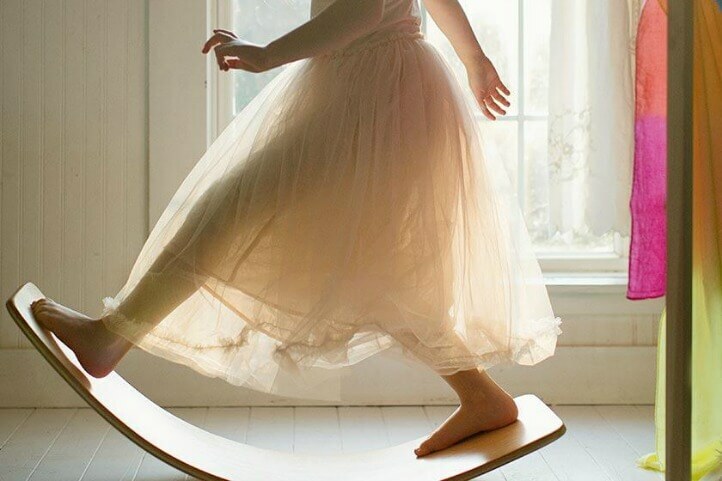 I would probably choose the wavee board or playframe to go with all the silks we have! I would get a wavee board. Or a dress up set. Or more silks. Or clips. I’ve been eyeing Sarah Silks on instagram for a while now…such fun stuff! 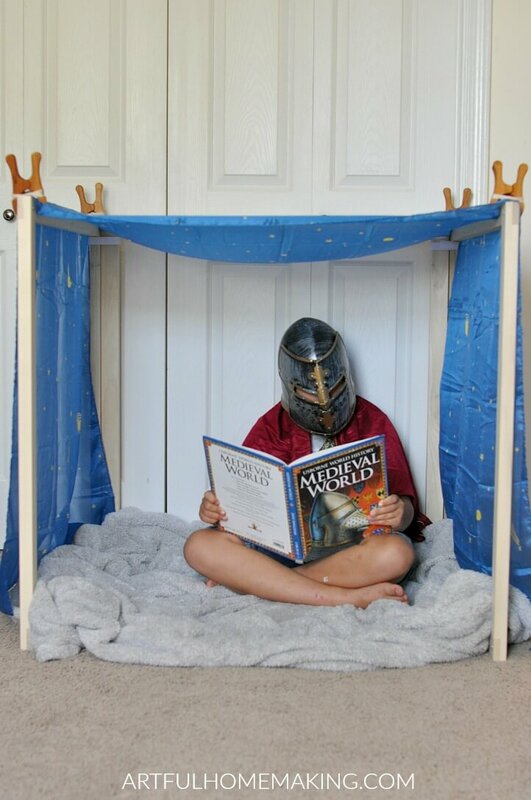 I love the versatility of the fort kit for puppets, forts, reading nook, etc. so that would be my first choice. That’s the same thing that drew me to the fort kit—it’s so versatile! Thanks for entering! This is such an amazing give-away! I sure would choose the wavee board. It’s on my wishlist for quite some time now, so this would be amazing to win! Thank you Joy! Love this! Natural and wood theme toys are great for imaginative play! I would get the soft sword for my adventure-loving boy, and the play fort since my 4 & 5 year old love making forts! That sword looks so fun! Aren’t their toys so beautiful? Love the baby blanket! We would love the giant playsilk and clips !! I would get the water board. I have had my eye on this toy for years. Love the wavee board, I know some kids that would be on that all the time. And the giant rainbow silk scarf is so amazing. I know, it’s awesome! I’d love to have one of those too! I love the way you set up your play frame fort Joy! And JoJo is adorable (your son too!). Thanks for your kind words and for hosting the giveaway. Thank you, Sarah! And thanks so much for sponsoring the giveaway! Ooohhh! My children would love the wavee board! I know, so many beautiful items to choose from! I would order the parachute and pocket play silks (or larger size), streamers and wands, a silk baby blanket would be great, and more! Any of those would be lovely! Thanks so much for entering the giveaway, Mary! If I won, I would get either a wavee board or a fort kit. I like the idea of the wavee board, but I can see my children fighting over it and the fort kit can be used by more than one at a time. That’s a good point about more than one being able to use the fort kit. Several of my children love to get in ours at a time (and it’s big enough that I can sit in it too!). I love the silk wings and the Baby Loveys. I love those too! The baby loveys are adorable.